As I mention in my FAQ, although Runners has gotten a lot of comparisons to Firefly, that show was never an influence on the series since I actually developed my premise and scripted the entire first story arc back in 1994-95, long before the show ever aired (and actually a couple years before Buffy even aired as a TV show!). By the time I got around to producing the actual artwork for issue #3 though, Firefly had come and gone. 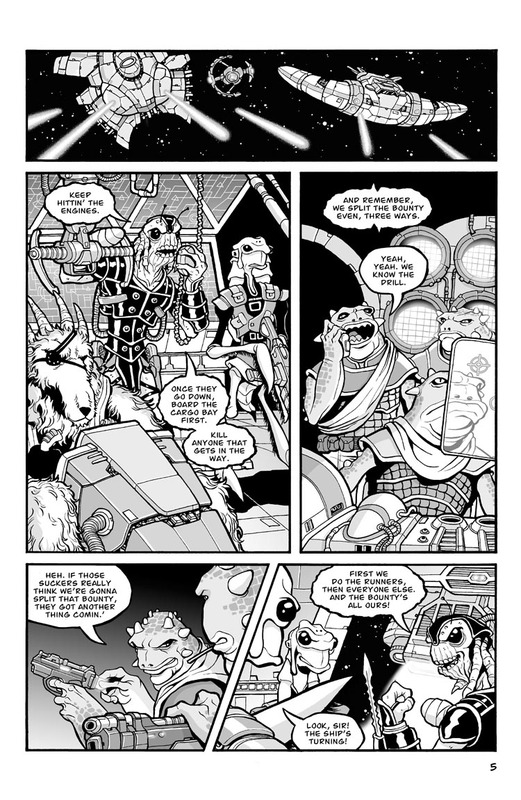 I was constantly revising small bits of the story as I was working on the art, and this is probably the only page that WAS directly influenced by Firefly. In the episode “The Train Job,” there was a great scene at the end, where a baddie is being set up to look like a recurring foil for the Serenity crew, only to be unceremoniously dispatched by being kicked into the ship’s engine. I’ve always loved how Joss Whedon shows can defy expectations like that, and I wanted to do something similar with this scene. In the original draft of the script, I didn’t cut to the bounty hunters. The Brimia was just being pursued by three ships with faceless crews. I decided to add this page to actually show what’s going on with those crews since I thought it would be fun to set up a situation for readers to expect something to happen (the Brimia being boarded), while making something else happen altogether. I also thought it’d be nice to show the bad guys and spread the wealth around a little bit, so that the focus of the scene wasn’t just on Roka’s crew, which felt a little static. I always like to have scenes that accomplish multiple things whenever possible, and I like how this added scene not only sets up a false expectation and shows more characters, but it also helps to flesh out the universe by showing just how cut-throat the business is. Everyone’s trying to screw over everyone else, and one alien is even missing a hand, which hints at some untold rough times in that character’s past. Or maybe he just lost the hand doing some woodwork. given his insect like appearance, I prefer to think that he lost his hand as a youth; when a giant mammal came over, picked him up, and pulled his hand off in an attempt to watch him squirm. This traumatic childhood event set him apart from all of the other bugs, thus making feel like an outcast and setting him on course for a life of villainy and criminal behavior.